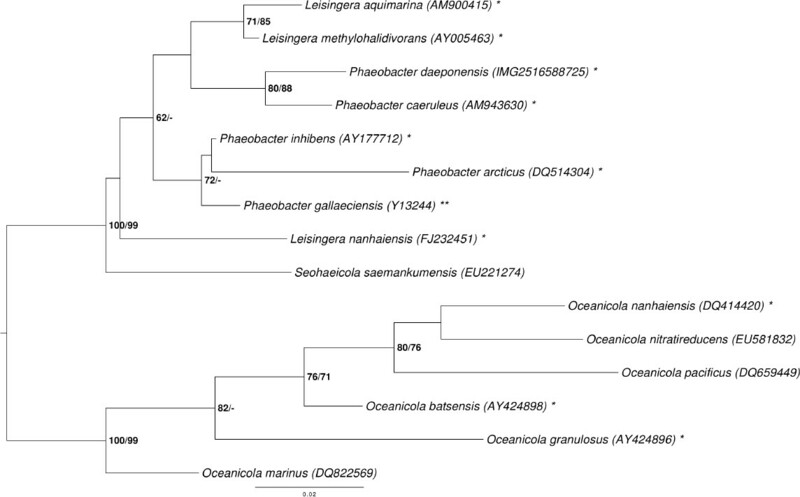 The genus Phaeobacter currently is comprised of five species (P. daeponensis, P. gallaeciensis, P. inhibens, P. arcticus and P. caeruleus) and is a part of the marine Roseobacter clade within the Alphaproteobacteria [1–5]. The genus name was derived from the dark brownish pigmentation of the type species P. gallaeciensis (phaeos = dark, brown) . Strain TF-218T, however, was described as not pigmented. Strain TF-218T (= KCTC 12794T = JCM 13606T = DSM 23529T) is the type strain of the species Phaeobacter daeponensis . It was isolated from tidal flats at Daepo Beach (Yellow Sea), Korea, which led to the species name of P. daeponensis . Secondary metabolite production is a well-known feature within the Roseobacter clade , especially within the Phaeobacter cluster, which shows high efficiency for secondary metabolite production . Examples include biosynthesis of the antibiotics tropdithietic acid (TDA) or indigoidine, quorum sensing by N-acyl homoserine lactones (AHLs), and presence of genes coding for nonribosomal peptide synthases (NRPS) and polyketide synthases (PKS) [6–11]. Furthermore, P. daeponensis was the first described facultatively anaerobic Phaeobacter species, which is capable of nitrate reduction . 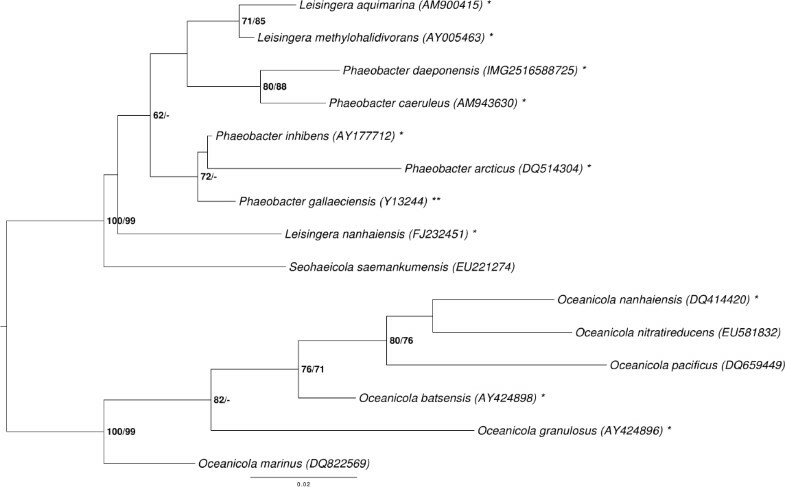 Phylogenetic tree highlighting the position of P. daeponensis relative to the type strains of the other species within the genus Phaeobacter and the neighboring genera Leisingera and Oceanicola [1–5,12–20]. The tree was inferred from 1,385 aligned characters of the 16S rRNA gene sequence under the maximum likelihood (ML) criterion as previously described . Oceanicola spp. was included in the dataset for use as outgroup taxa. The branches are scaled in terms of the expected number of substitutions per site. Numbers adjacent to the branches are support values from 1,000 ML bootstrap replicates (left) and from 1,000 maximum-parsimony bootstrap replicates (right) if larger than 60% . Lineages with type strain genome sequencing projects registered in GOLD  are labeled with one asterisk, those also listed as ‘Complete and Published’ with two asterisks [23–25]. 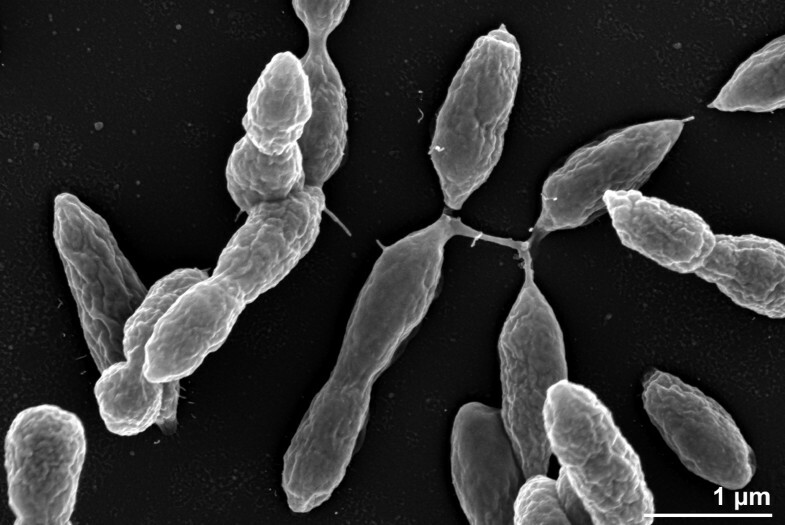 The genomes of six more Leisingera and Phaeobacter species are published in the current issue of Standards in Genomic Science [26–28]. A representative genomic 16S rRNA gene sequence of P. daeponensis TF-218T was compared with the Greengenes database for determining the weighted relative frequencies of taxa and (truncated) keywords as previously described . The most frequently occurring genera were Ruegeria (31.6%), Phaeobacter (28.8%), Silicibacter (13.6%), Roseobacter (13.3%) and Nautella (3.6%) (713 hits in total). Regarding the five hits to sequences from the species, the average identity within HSPs was 99.9%, whereas the average coverage by HSPs was 19.0%. Regarding the 45 hits to sequences from other species of the genus, the average identity within HSPs was 97.8%, whereas the average coverage by HSPs was 18.9%. Among all other species, the one yielding the highest score was Roseobacter gallaeciensis (AY881240), which corresponded to an identity of 98.6% and an HSP coverage of 18.8%. (Note that the Greengenes database uses the INSDC (= EMBL/NCBI/DDBJ) annotation, which is not an authoritative source for nomenclature or classification.) The highest-scoring environmental sequence was AF253467 (Greengenes short name ‘Key aromatic-ring-cleaving enzyme protocatechuate 34-dioxygenase ecologically important marine Roseobacter lineage d on Indulin seawater’), which showed an identity of 99.8% and an HSP coverage of 18.8%. The most frequently occurring keywords within the labels of all environmental samples which yielded hits were ‘microbi’ (2.8%), ‘marin’ (2.7%), ‘coral’ (2.4%), ‘diseas’ (1.8%) and ‘water’ (1.8%) (492 hits in total). The most frequently occurring keywords within the labels of those environmental samples which yielded hits of a higher score than the highest scoring species were ‘marin’ (17.4%), ‘sediment’ (8.5%), ‘aromatic-ring-cleav, ecolog, enzym, import, indulin, kei, lineag, protocatechu, roseobact, seawat’ (4.4%), ‘coco, island, near, site’ (4.3%) and ‘redox-stratifi, reef, sandi’ (4.3%) (4 hits in total). P. daeponensis TF-218T is a Gram-negative, facultatively anaerobic, mesophilic marine bacterium with an optimal growth temperature of 37°C and an optimal salt-tolerance between 0.1 and 8% (w/v) NaCl. The optimal pH for growth is between 7.0 and 8.0 with pH 5.5 being the lowest possible pH at which growth occurs. Strain TF-218T possesses oval cells 0.4–0.9 × 0.7–2.0 µm in size (Figure 2) and is motile by means of a single polar flagellum. On marine agar circular, slightly convex, smooth, glistering, yellowish-white colonies 1.5–2.5 mm in diameter are formed . TF-218T utilizes D-glucose, glycerol, leucine, serine, acetate, citrate and succinate . The utilization of carbon compounds by P. daeponensis was also determined for this study using Generation-III microplates in an OmniLog phenotyping device (BIOLOG Inc., Hayward, CA, USA). The microplates were inoculated at 28°C with a cell suspension at a cell density of 95–96% turbidity and dye IF-A. Further additives were vitamins, micronutrients and sea-salt solutions. The exported measurement data were further analyzed with the opm package for R [30,31], using its functionality for statistically estimating parameters from the respiration curves and translating them into negative, ambiguous, and positive reactions. The strain was studied in two independent biological replicates, and reactions with a different behavior between the two repetitions were regarded as ambiguous. The draft genome sequence was generated using Illumina sequencing technology. For this genome, we constructed and sequenced an Illumina short-insert paired-end library with an average insert size of 221 bp, which generated 21,978,034 reads, and an Illumina long-insert paired-end library with an average insert size of 9,327 +/− 1,586 bp, which generated 19,261,756 reads totaling 6,186 Mbp of Illumina data. All general aspects of library construction and sequencing performed can be found at the JGI web site . The initial draft assembly contained 15 contigs in 10 scaffold(s). The initial draft data was assembled with Allpaths  and the consensus was computationally shredded into 10 kbp overlapping fake reads (shreds). The Illumina draft data was also assembled with Velvet , and the consensus sequences were computationally shredded into 1.5 kbp overlapping fake reads (shreds). The Illumina draft data was assembled again with Velvet using the shreds from the first Velvet assembly to guide the next assembly. The consensus from the second Velvet assembly was shredded into 1.5 kbp overlapping fake reads. The fake reads from the Allpaths assembly, both Velvet assemblies, and a subset of the Illumina CLIP paired-end reads were assembled using parallel phrap (High Performance Software, LLC) . Possible mis-assemblies were corrected with manual editing in Consed . Gap closure was accomplished using repeat resolution software (Wei Gu, unpublished), and sequencing of bridging PCR fragments with PacBio (Cliff Han, unpublished) technologies. A total of 2 PCR PacBio consensus sequences were completed to close gaps and to raise the quality of the final sequence. The final assembly is based on 6,186 Mbp of Illumina draft data, which provides an average 1,345 × coverage of the genome. The genome statistics are provided in Table 3 and Figures 3a–3e. The genome consists of five scaffolds with a total length of 4,642,596 bp and a G+C content of 64.3%. The scaffolds reflect a chromosome that is 3,984,464 bp in length along with four extrachromosomal elements. Of the 4,388 genes predicted, 4,310 were protein-coding genes and 78 RNA genes, including four rRNA operons. The majority of the protein-coding genes (80.7%) were assigned a putative function, while the remaining ones were annotated as hypothetical proteins. The distribution of genes into COGs functional categories is presented in Table 4. The 276 kb RepC-8 type replicon pDaep_A276 contains an additional DnaA-like I replicase gene (Daep_04147), but the parAB partitioning operon is lacking (Table 6). This distribution may be the result of a plasmid fusion and a functional inactivation of one replication module. This explanation is in agreement with the presence of two post-segregational killing systems (PSK) each consisting of a typical operon with two small genes encoding a stable toxin and an unstable antitoxin . Moreover, this RepC-8 type plasmid contains a large type-VI secretion system (T6SS) with a size of about 30 kb. The role of this export system has first been described in the context of bacterial pathogenesis, but recent findings indicate a more general physiological role in defense against eukaryotic cells and other bacteria in the environment [56–58]. 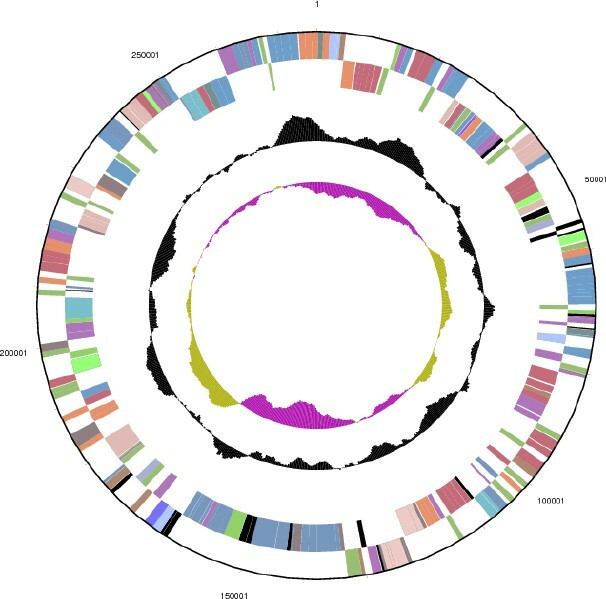 We found T6S systems also on DnaA-like I type plasmids of P. caeruleus DSM 24564T (pCaer_C109), L. methylohalidivorans DSM 14336T (pMeth_A285) and L. aquimarina DSM 24565T (pAqui_F126). The 174 kb plasmid pDaep_B174 contains two RepABC-9 type replication modules (Figure 3a). Both of them harbor a specific perfect palindrome sequence (5′-ATCCGCG’ [RepABC-9a]; 5′-TTGCACG’ [RepABC-9b]) that may represent the functional cis-acting anchor for plasmid partitioning . 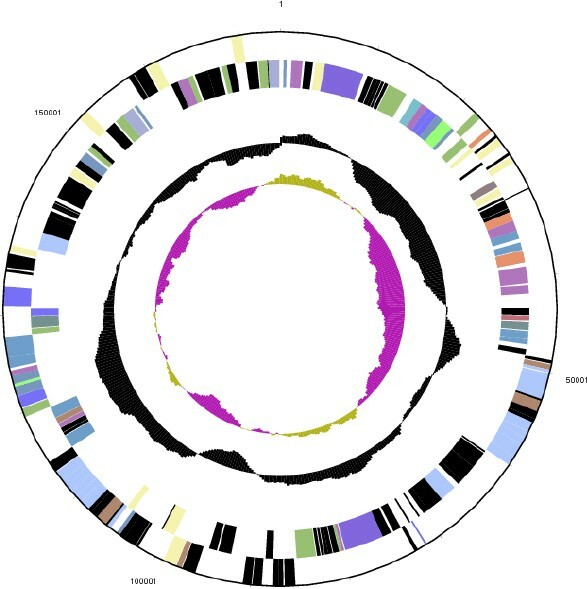 This composite replicon may have either originated from a plasmid fusion or from a horizontal recombination. The latter explanation is supported by two site-specific XerC recombinase genes (Daep_04383, Daep_04398) that are located head-to-head adjacent to the two replicases repC9-a and repC9-b. P. daeponensis was described as a facultatively anaerobic bacterium that uses nitrate as electron acceptor . We found genes involved in nitrogen metabolism scattered over the chromosome, involved in the pathways of the assimilatory and the dissimilatory nitrate reduction to ammonia (Daep_03263, _03264 and _03265; Daep_03099, _03100, _03263 and _03264) [63–65]. Furthermore, we detected all genes necessary for the dissimilatory nitrate reduction to nitrogen, including a cluster for the nitrate reductase (Daep_03099, _03100), the nitrite reductase (Daep_02798), the nitric oxide reductase (Daep_00020, _00021) and the nitrous oxide reductase (Daep_03697) . P. daeponensis encodes a gene transfer agent (GTA), a virus-like particle that mediates the transfer of genomic DNA between prokaryotes . The GTA cluster has a length of ∼17 kb (Daep_01107 – Daep_01126) and has a high homology to GTAs of other Phaeobacter species, e.g. the P. inhibens strains DSM 17395, 2.10 and T5T [28,67]. Screenings for genes coding for phage-related proteins gave hits for a phage integrase (Daep_00002, _00008 and _01212) and a phage-related gene (Daep_02906), but no complete prophage genomes were detected. Phylogenetic analysis shows that P. daeponensis and P. caeruleus form a cluster together with the Leisingera species L. methylohalidivorans and L. aquimarina (Figure 1). The cluster is set apart from the clade comprising P. gallaeciensis, P inhibens and P. arcticus, but the backbone of the 16S rRNA gene tree shown in Figure 1 is rather unresolved. Using the Genome-to-Genome Distance Calculator (GGDC) [69–71], we performed a preliminary phylogenomic analysis of the draft genomes of the type strains of the genera Leisingera and Phaeobacter and the finished genomes of the P. inhibens strains DSM 17395 and 2.10. Table 7 shows the results of the in-silico calculated DNA-DNA hybridization (DDH) similarities of P. daeponensis to other Phaeobacter and Leisingera species. The highest values were obtained for P. caeruleus, L. aquimarina and L. methylohalidivorans, thus confirming the 16S rRNA gene analysis. A reclassification of P. daeponensis and P. caeruleus as species of the genus Leisingera is one possible solution to taxonomically better represent the genomic data.